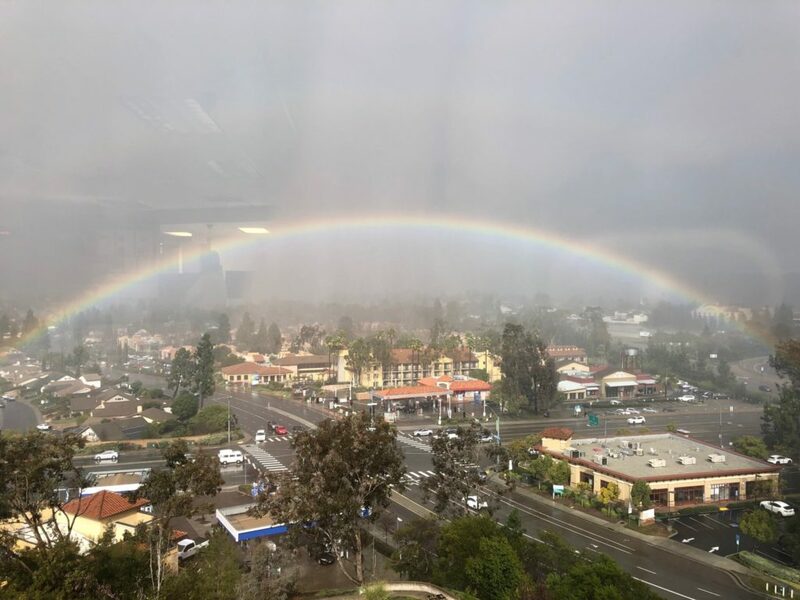 The latest in a series of winter storms that have brought heavy showers, high winds and mountain snow to the San Diego area in recent weeks delivered another round of wet and blustery weather to the region Monday. The spate of unsettled conditions continued soaking the county through the morning and afternoon, adding to already significant recent rainfall tallies. As of 4 p.m., according to the National Weather Service, five-day rain totals had reached 6.19 inches at Birch Hill; 5.93 in the Palomar area; 4.01 in Bonsall; 3.84 in Mesa Grande; 3.82 in Fallbrook; 3.55 at Lake Cuyamaca; 3.49 at Henshaw Dam; 3.32 in Oceanside; 3.29 in Pine Hills; 3.27 at Volcan Mountain; 3.05 in Julian; 2.89 in Santa Ysabel; 2.73 in Ramona; 2.53 in Barona and Poway; 2.45 in Descanso and Valley Center; 2.42 in Carlsbad; 2.35 in Mission Valley; 2.3 in Flinn Springs and Warner Springs; 2.27 in La Mesa; 2.25 in Escondido; 2.21 in Granite Hills; 2.16 in Kearny Mesa; and 2.06 at Lindbergh Field. Other cumulative precipitation amounts included 1.99 inches in San Onofre; 1.95 in San Marcos; 1.92 in Pine Valley; 1.9 in Alpine; 1.85 in Encinitas; 1.83 at Mount Laguna; 1.82 in San Ysidro; 1.7 in Ranchita; 1.65 at Brown Field airport; 1.54 in Solana Beach; 1.42 in Campo; 1.27 in Tierra del Sol; 1.06 in San Felipe; 0.49 in Agua Caliente; 0.46 in Borrego Springs; and 0.19 in Ocotillo Wells. Though no new local snowfall had been recorded as of late afternoon, that situation was due to change. Flurries of frozen white flakes were expected to begin coming down in the highest local elevations Monday evening before moving into lower areas overnight, NWS meteorologist Alex Tardy said. By late Tuesday, snow is likely to have fallen as low as the 2,500- foot level, with six or so inches expected to accumulate in Julian and possibly twice that amount on Palomar Mountain and Mount Laguna, Tardy said. A winter storm warning for the eastern San Diego County highlands went into effect at 4 p.m., effective through 4 a.m. Wednesday, warning of frigid conditions and difficult travel conditions in mountain locales. The precipitation was expected to continue through Tuesday night, followed by dry and warming conditions until the end of the workweek, according to forecasters. Yet another low-pressure system could bring more rainfall to the region late Friday and, possibly, through next weekend, the weather service advised. Updated 11:46 p.m. Feb. 4, 2019.